Pierogi are dumplings of unleavened dough first boiled, then they are baked or fried usually in butter with onions,“ traditionally stuffed with potato filling, sauerkraut, ground meat, cheese, or fruit. 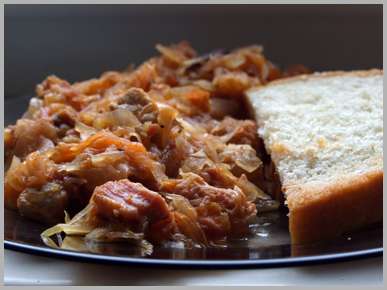 Of central and eastern European provenance, they are usually semicircular, but are rectangular or triangular in some cuisines. 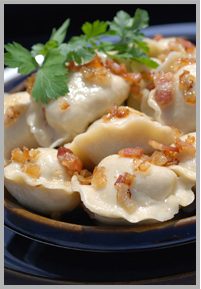 Our pierogi are handmade and have won over hundred awards all over the US. 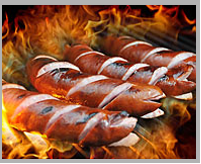 Real Polish Sausage grilled to perfection comes on the bun with caramelized onions and green onions. 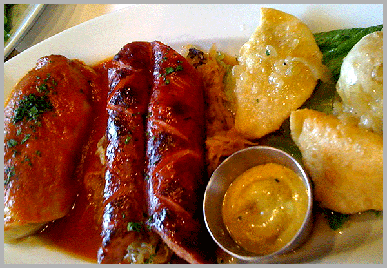 Our Polish Sausage comes from the best Polish meat shop in Chicago and it is prepared according to a 200 year old recipe. 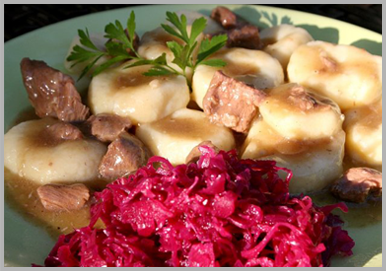 Sillesian Dumplings with pork Goulash Small round potato dumpling covered with delicious pork goulash.